Run, secure and manage your WordPress websites on one single dashboard. Plesk has easy to use, straight forward and powerful interface that allows webmasters to manage and secure their WordPress websites with few simple clicks. With Plesk, webmasters can easily all kinds of routine website management tasks on a single server in order to reduce operating costs and resources. Plesk offers high level of security, usability, operating system compatibility which allows webmasters to use Plesk control panel with shared, VPS or even dedicated hosting for both Linux and Windows platforms. Suitable for web admins who need to build basic and simple WordPress websites and manage their domains with basic management requirement, without the extended tools and features. Suitable for web professionals who need to build many business or corporate websites using the WordPress platform and manage them in one single dashboard with full flexibility. Suitable for web hosters to create and manage multiple shared hosting accounts for their clients no matter what configuration they want. The clients have own control panel to build, secure and run their own websites. 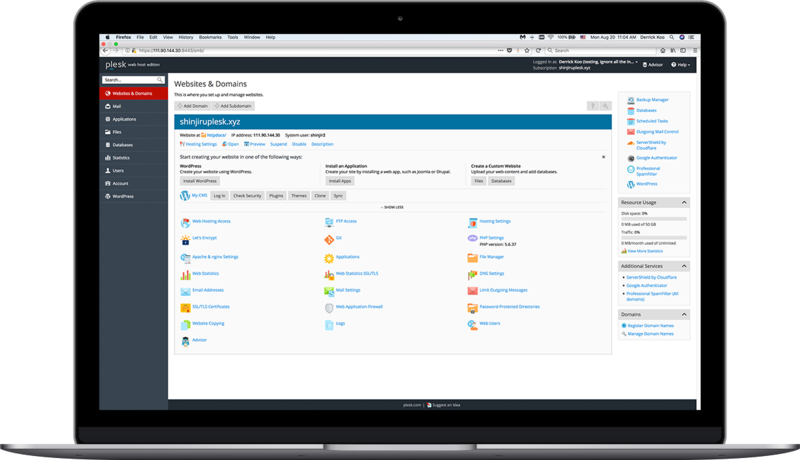 Awesome Features of Plesk Control Panel. Supports all Major Databases like MySQL, MariaDB, PostgresSQL, MSSQL , supports backup, restore, import and export functions.